Jason stared intently at the open engineering panel laid out in front of him - lights blinking and sparks occasionally flying forth. It's a mess. He pulls out a pair of pliers and a portable soldering iron from one of the seemingly innumerable pockets on his overall, and his mind flicks through various solutions to the problem sitting in front of him. Knowledge is good, but it's no substitute for experience, which Jason has in spades, so as he gets to work breaking wires and repairing frayed connections the steps start to come more easily to him. Skills describe what your character is personally capable of. If it's something outside the realms of simple day to day existence, chances are there's a skill for it. As standard, your characters are usually as good as the average person at day to day activities without having taken a skill in that area. For each skill, we have given an idea of what we’d expect your character to be able to do in this area without taking the skill or any of its specialisms. Skill points are then yours to spend wherever you want to improve on that base. At Character Creation you have 5 points to spend on Skills and specialisms. It costs 1 point to purchase any skill or specialism. In Princess, there are 8 General Skills each of which have specialism skills. In order to purchase a specialism, you must first purchase the General Skill. Taking a specialism does not mean that you are equally worse in other areas: specialisations are always purely additive. There is no limit to the number of specialisms you can learn. For example: Jeff wants to create a character with the Ranged Combat Specialism. It will cost him 2 points to do this - 1 to acquire General Combat and 1 to then acquire Ranged Combat. It is possible to learn new Skills over the course of the game: see Advancement. You know what weapons look like, and you have seen them used in films. You may have once shot a clay pigeon, or punched a school bully in the face. You know not to hold things at the pointy end, but beyond that you’re going to have to rely on a lot of luck if you get into a fight. 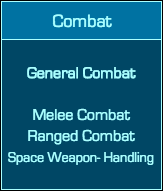 With General Combat, you have a basic understanding of how most weapons work and good understanding of how to handle yourself in a combat situation. Your experience is far from perfect, but when the excrement hits the FTL drive it will keep you from being the first to hit the floor. You have a strong understanding of melee weapons and how to use them effectively in a fight. In a hand-to-hand combat situation you can handle yourself well. You'll do fine in a boxing match, or indeed in a chainsaw fight… that being said, beware of the old adage about knives and gun fights. You have a strong understanding of how handheld ranged weapons work and can handle yourself well in a ranged combat situation. For instance, you'll do fine in a ranged laser gun battle down a corridor, and can throw grenades with good accuracy. With supplies what they are, you'll be well advised to keep a close eye on your ammo. You have a strong understanding of large ship-based weapon systems and can handle them well in a combat situation. You're fine behind the controls of a laser turret or a missile rack and know how to use these to effectively dominate a combat situation. If your ship of choice is a small fighter, however, you better also know how to pilot the thing effectively or all the marksmanship in the universe won't keep you safe from return fire. You can appreciate the finer things in life, and may cheer yourself up a little occasionally with a bit of colouring in, but you seem to lack the creative spark that allows others to make something exciting and new from what appeared to be everyday items. 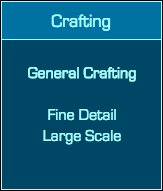 General Crafting gives you the ability to make things that would improve the quality of life aboard the fleet for you or others. Perhaps you are a budding musician, a wood carver, or a pastry chef: whatever you avocation, you can do it better than the average person in the fleet. Note that this doesn't allow you to make highly functional items - for which you would want the Technology tree - or provide you necessarily with the needed materials, unless they are easy to come by. You are well versed in creating works of art or luxury that use fine detail. Whether this is paintings with details to rival the classical masters, or an intricately crocheted bedspread these details could be used to try and convey a more in-depth meaning to a small group, or simply just have enough detail to apply to a large one. You are capable of producing large works of art. Extended dinners for sizeable groups, wall-sized murals (depending on the size of the wall), and extended wardrobes of outfits are all within your capabilities. This doesn't mean that the individual items will be any more or less skilled, but that producing more of them, or a larger single item is possible. You will notice when things change noticeably around you. If what has changed has made no effort to disguise how it has changed or why, you will be able to come to your own conclusions about the matter but you will not necessarily make the same deductive leaps as someone trained in this skill, or you may well miss evidence you weren’t aware was there. Note: you don't necessarily need Investigation to apply other skills in an investigative manner (for instance, if you have Hacking you can use that to find the files you're looking for on someone else's computer). 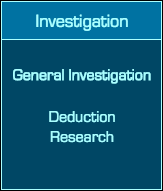 With General Investigation, you have the ability to notice when something is more subtly off or doesn't quite add up and to sensibly follow clues. Whether you are doing a thorough dissection of a single room or event, or coming to a snap conclusion, this will help you avoid any obvious red herrings and keep you on the right track. You know how to use investigative tools such as forensic kits where available, and have a good idea of how to structure an enquiry to good effect. You have the ability to make leaps of logic given two pieces of evidence. While others may look at evidence they've acquired and try to work it out, the “obvious” deduction will come to you very quickly. Of course this doesn't always help you in finding the evidence in the first place: but that's what you have lackeys for. You are able to look through documents and data to find out something that is otherwise unknown. This won't help you learning new skills, but will help you uncover information from documents others would simply brand “tl;dr”1). As the converse to Deduction, simply having the information doesn't necessarily mean that you'll know what to do with it next. You have no formal medical training. Possibly you went on a half-day first aid course about a decade ago and have vague memories of triangular slings. You will be able to tell when some injuries are serious by the sheer amount of blood on the floor, and you can apply antiseptic wipes and plasters, but you will not be able to take effective action against any serious health issue or injury and may well make things worse if you try to do so. 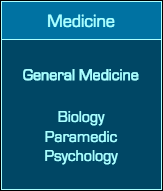 General Medicine gives you a basic understanding of human anatomy: enough to be able to say which bits should go back where when they fall out, and how to put people back together with the right equipment. This is all subject to the regular laws of biology: you're not going to be able to stick a dead arm back onto a living person, though with the right technology you might be able to delay the arm getting to the 'dead' point. Biology gives you a greater understanding of biological matter: human, non-human, plant-life and otherwise. You understand these things and could potentially apply your knowledge to understanding unknown species if you were to come across them. You can apply medical skills in emergency situations to patch people up from major injuries for long enough to get them out of danger and back to somewhere they can be properly treated. This would require you having sufficient supplies to ensure that any treatments don't have adverse effects, but when you have no other choice it's worth the risk. Right? You understand how people's minds are likely to work and can apply your skills to helping people with their fears perhaps by calming their mind (or making it worse by agitating them!) Usually your best bet for success in this field would be having a willing patient, as under normal circumstances the human brain is quite resistant to deliberate interference. You are as charming and convincing as the average person. How well your ideas and/or bald-faced lies are received by others will depend more on their biases and abilities than on any skill of yours. 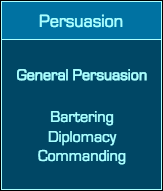 General Persuasion gives you the ability to have others listen to you and for you to sound convincing in conversations, as well as the ability to lie more competently than the average person in the fleet. The gift of the gab is not something that everyone possesses, but a few golden words can go a lot further than any number of laser guns, in the right places. You've got a good idea of how much things are actually worth, and how much you really want to get for your goods. You can swing a better deal for yourself when negotiating trades, but up against really hard-nosed negotiators this won't necessarily be the most useful in finding new places to off-load or buy up your legitimately gotten goods. You have a commanding presence and people will tend to do what you order them to do. You'll be able to react well to sudden crises and instruct crew and others calmly and confidently in such times. You better be certain that your plan is a good one, as this will only help making people follow it through, not necessarily realising flaws in it. You know how to talk smoothly enough to keep a diplomatic tongue when talking to others. Your tongue is silver enough that you can sometimes even convince people that your ideas were theirs to start with and generally get your way. Nothing in this world is as valuable as a friend when it really counts and, while this is not always a substitute, this certainly helps. You have seen the inside of the occasional spaceship control deck on TV documentaries. You have no idea what the multitude of little buttons and dials actually do, but would have to hope that they are labelled helpfully, should you ever need to touch them. 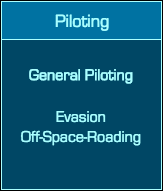 General Piloting allows you to get behind the controls of a spaceship and be certain that, under normal circumstances, you are not going to crash into an asteroid, or a planet… or a sun. Consider this the equivalent of owning a driving licence: you can pilot, just not necessarily well in stressful situations. You have a good grasp of your ship's space and momentum - and those of other objects in space. You can dodge well in a dogfight, navigate fast moving objects, and generally stop your ship from being spread across 2 kilometres of space: especially while in combat. However even the best pilot in the world can't overcome basic physics: a tiny fighter is always going to be more manoeuvrable than a cruiser. Your piloting skills extend beyond the void of space and you can fly or drive vehicles in difficult environments such as within an atmosphere, on the surface of a large asteroid or through a nebula. The ability to keep a ship stable even in dangerous circumstances makes the almost compulsory exploration that comes with the spacefaring life much easier to bear. You are capable of an average level of forethought, and particularly making current To Do lists in your own life (i.e. filling out a turnsheet for the next three weeks). However, while you may have come across advanced scheduling ideas you don't really know how to apply them effectively. 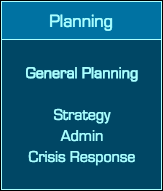 General Planning gives you the ability to come up with sensible plans for more complex undertakings and foresee potential problems beyond what the average person could do. Putting them into practice is another matter, and even the best plan in the world is worthless if you can't convince people to go along with it. But it is a good starting point. You're able to manage the affairs of a ship or operation, particularly when it involves ensuring all the numbers add up. For instance, ensuring the ship's manifest is correct when departing a hangar; ensuring that the goods that arrived on your ship were exactly what you were expecting to arrive on your ship. You react well to crises and will be able to come up with a quick response plan within moments of something going unexpectedly wrong. Being able to keep a level head in these situations is vital to success, and having a good plan to help the others that you're working with is always valuable. You are able to come up with plans for larger scale operations involving multiple parties, such as organising a mining operation on an asteroid or the combat operation of a squadron of fighters. You can see the moving cogs in the complex machine that is your plan, and how changing any one of them affects the bigger picture. You’ve never had to practice moving yourself around stealthily and quietly, and you’re relying on vague memories of book characters saying not to step on dry twigs or whisper too loudly. 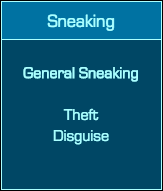 You’re not ridiculously clumsy, but you will make errors if attempting to move around entirely undetected. You have the ability to effectively disguise yourself to look like another person. This disguise will fall apart if you try to act like them as well, particularly for extended periods of time, but will stand up to visual inspection. However, if you happen to end up in the same room as the person you are impersonating, you had better be sure that you have an exit plan. You can steal from others quite effectively, so long as nothing is being employed against you. You can get in, take what you're looking for, and then get out again without being noticed. There is, however, no reason why your victim cannot track you down and steal it back from you. You can use most consumer-facing technology that exists, with occasional recourse to the manual. You should be able to spot when something simple has gone wrong, such as ‘my computer has become unplugged,’ but any attempts to open up bits of technology and mess around with their innards are likely to end poorly, or at least with a non-functioning former piece of technology. General Technology gives you a basis for understanding and manipulating technology. You can roughly jury-rig things together, and have a degree of competency with computers. You're not a technological genius, nor would have even been described as a whizz-kid back on Earth, but you can keep things running well enough. You can hack and manipulate computers to attempt to make them do what you want. This includes offensive and defensive hacking against another ship's systems, but also reprogramming on a system that isn't trying to fight back. Your understanding of the technological lifeline that keeps you alive in the cold darkness of space is a lot more robust that the average inhabitant of the fleet. Using this understanding you are able to create, repair, and sabotage familiar technology. This on its own won't allow you to create fantastic new gadgets, but by linking things together you can create interesting new effects. While this skill provides you with the ability to make technology, it doesn't give you the materials, and these will need to be sourced in play. You know the basis of ship engineering and can hope to make repairs, constructions and customisations to your, or others', ships. You can't do this without the tools or resources, of course, but in the right place and at the right time you'll be able to stretch the fleet just that little bit further. 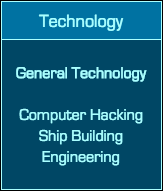 While this skill provides you with the ability to construct spaceships, it doesn't give you the materials, and these will need to be sourced in play.